Note: the DM High Recommendation Tag applies to the 2nd Edition booklet, not the 1st Edition booklet. LFT surprised the ASL world in the summer of 2013 by venturing into the world of play aids. This is a realm of ASL that third party publishers rarely exploit (one recent exception was Countersmith Workshop, but they seem to have become inactive), though it is probably ripe for exploitation. MMP itself has never had any interest in ASL play aids or accoutrements, leaving an open field for those with initiative. One third party publisher with initiative is LFT, which proved it by releasing what it calls the LFT Rat Pocket Charts, the “rat” apparently being a reference to LFT’s mascot, Rat Barricades. 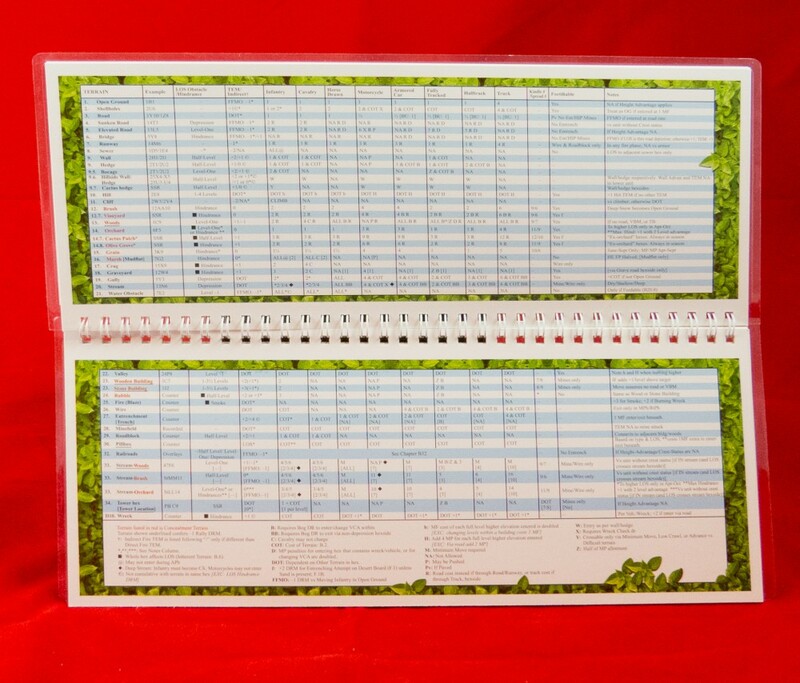 The Pocket Charts are an extremely useful ASL play aid, consisting of most of the main ASL charts and tables combined together in a half-page (long-wise) laminated, spiral-bound booklet. This format is far less bulky and far easier to use than the traditional ASL charts in a three-ring binder. It really is an improvement over the official charts in most respects (see below). Here is a page-by-page list of what charts and tables are included (2016 note: 2nd Edition info added). 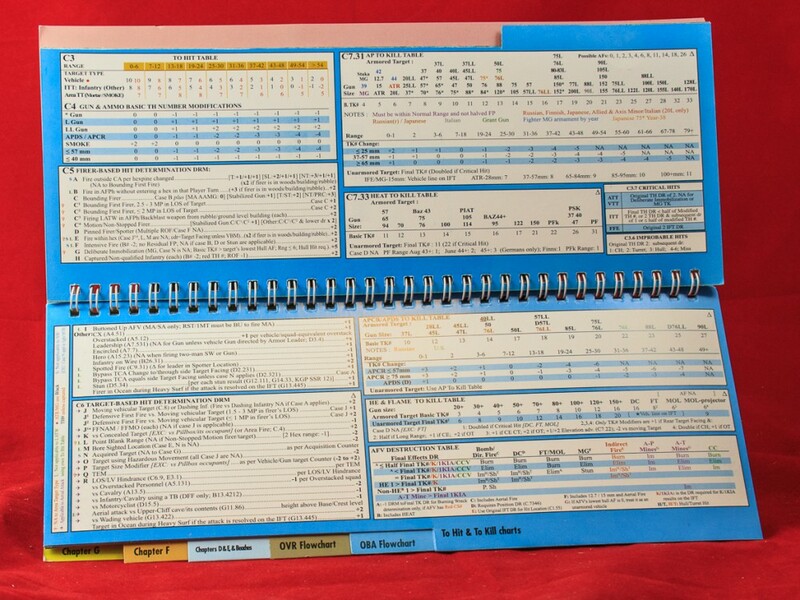 Note that one flaw in the Pocket Charts is that it has no page numbers or index, so you have to flip through the whole thing until you find the chart you want. If this is ever re-printed, the booklet needs page numbers and an index (which can easily go on the essentially blank final page). 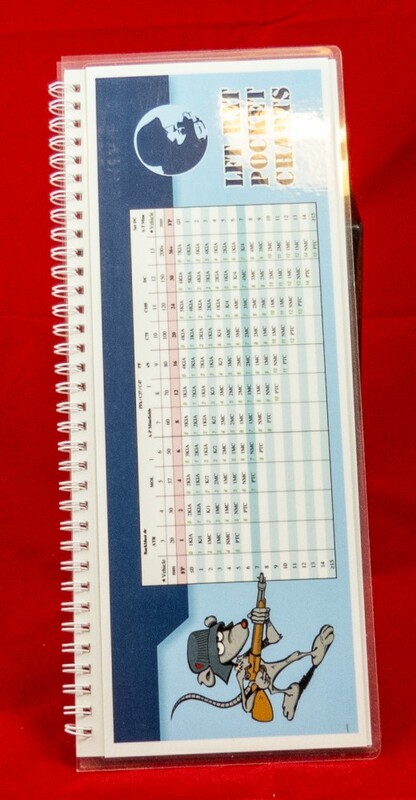 The Pocket Charts are not without flaws or issues. One is essentially unfixable–the charts are typically smaller than they appear in their official form and therefore sometimes less readable. Another problem, for Americans, is that the chart booklet (based on European paper sizes) is too long. This is theoretically fixable (for future versions)–the pages can be cut down a bit without really affecting the presentation–but given that the publisher is European, LFT is unlikely ever to do so. One issue for some will be that the charts are essentially organized not by frequency of use but by rulebook chapter. This is why, for example, the To Hit and To Kill tables, among the most used charts in ASL, are buried deep in the booklet (pages 14-15). Or why the PTO tables appear at the very end, after the Night Rules tables. One of the few advantages of the official charts and tables is that one can arrange the various fold-out cardstock inserts in whatever way one wanted. Here one is essentially forced to use the organization mandated by IFT. The lack of an index increases the problem. Another issue is that opportunities for improvement were sometimes overlooked. For example, the Terrain Effects Chart simply repeats the “official” TEC’s order of terrain, an order that is not alphabetical, as it should be, but uselessly dependent on the arbitrary order the terrain is presented in Chapter B (which no one remembers). They missed a great chance to improve upon the original. The reason why there are few improvements or changes to the charts stems from the Pocket Charts’ biggest and most controversial issue. The vast majority of the charts and tables are simply scanned versions of the official charts and tables. Though LFT has the capability to lay out its own versions of these charts and tables, they chose not to. They reproduced the official AH/MMP tables lock, stock and barrel, opening up various legal and/or ethical issues. Moreover, a few of the scanned tables weren’t even well-scanned. This gives a few of the pages a somewhat shoddy look. The appropriation and reproduction of the official charts and tables adds an unpleasant aspect to what would otherwise be a definitely positive addition to the ASL world. What really needs to happen is for LFT to create a new, “2nd Edition” version of these charts, that would include an index (and perhaps some re-ordering), should look for areas to improve upon the original charts and tables, and most importantly, would contain original renderings of these charts and tables rather than scans of the originals. 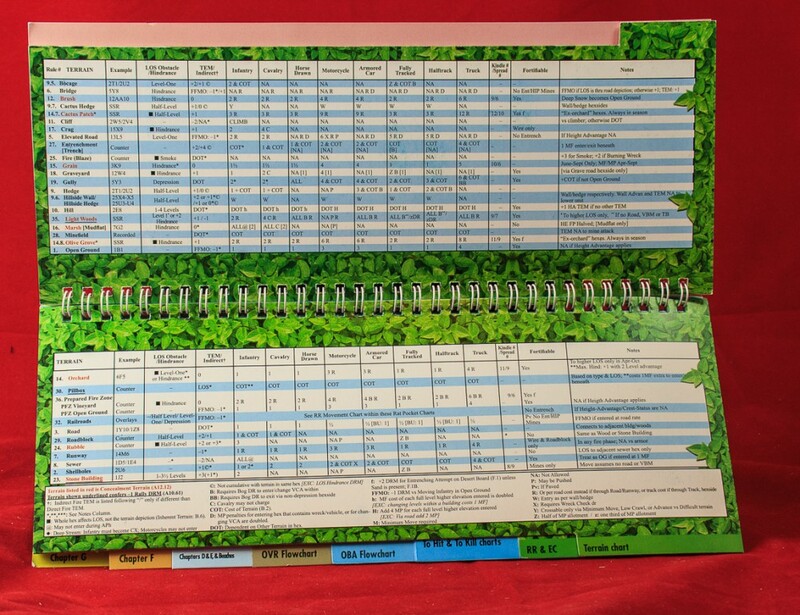 If LFT could do that, they would be doing many ASLers a solid service, because the idea of a laminated booklet of charts and tables is a very good one. 2nd Edition Comments: About a year and a half or so after the release of the LFT Rat Pocket Charts, LFT released a second edition with some noteworthy changes. This was something LFT had planned for some time, responding to criticisms (constructive and otherwise) and suggestions from people in the ASL community. There are a number of changes in the second edition, most important among them the fact that all of the charts and tables seem to be of original composition rather than, as in the first edition, scanned from official MMP charts and tables. This is really important to anyone who wants to purchase ethical third party products. The second major change is that the lamination is gone (the LFT website says that the cover is still laminated, but it is not). This is not a major issue but it may concern some. The pages of the booklet are actually sturdy cardstock and so can take a lot of wear and tear. However, the inclusion of tabs (see below) does introduce a bit of extra vulnerability. Players who think they will frequently use these charts might want to consider purchasing more than one, to have a spare (especially considering these come from a European third party publisher). The third change is that the booklet is thicker, in that it is 36 pages long, rather than the 28 pages of the original booklet. In other words, there is more content in the second edition than in the first, including expanded national capabilities charts (including the revised Finns) and terrain charts, as well as a number of new charts (see table, above, for complete list and comparison with first edition). A number of the tables and charts have been improved, either in layout, look, or content. Chief among these is the Terrain Effects chart, which now comes with all of the (ETO) terrain in alphabetical order rather than the useless (and functionally random) order that it appears on the official terrain chart. This was a suggestion made by Desperation Morale. With all that content, how do you find the chart you are looking for? This was something of a problem in the first edition, which had no page numbers and no index. The second edition still has no page numbers and no index. These are really needed (a list of charts would fit on the back cover), because it is very easy to flip two pages at once and miss the chart you were looking for (indeed, when this author was counting the pages of the booklet, he had to count four times before he got an accurate count, because it is so easy to turn over multiple cardstock pages at once). However, the second edition does have one addition which helps to some degree: it contains color-coded tabs that can take you straight to certain charts (such as the all-important To Hit & To Kill charts). 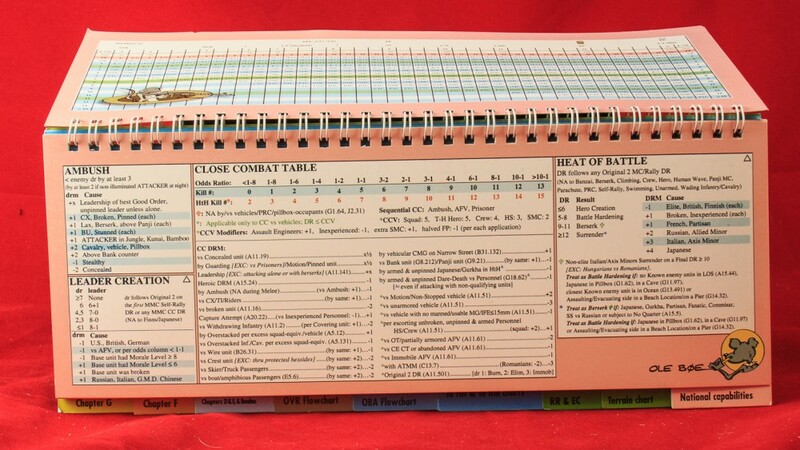 This is very handy, although the tabs will get worn over time. However, there are still a number of charts that are hidden away in non-intuitive places where one would never think to look for them (for example, the Original doubles, 2, 11, and 12 charts are hidden away in the green “terrain/Chapter B” section, and the Kindling Attempt chart is two pages away from all the other Kindling & Spreading tables). So page numbers and a list of contents are still needed.A couple of ASLers have cut notches into the tabs to make all the pages easier to get to. Some of the tables and charts would also benefit from additional minor improvements. 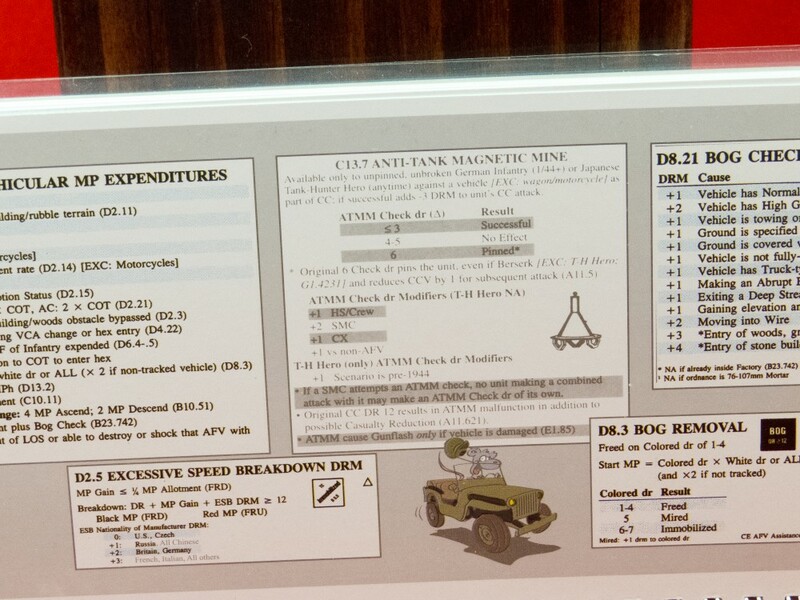 For example, the IFT chart on the front of the booklet would benefit by a larger, bold and more visible FP line (this author has already had several opponents attempting to use the Vehicle line against him), or even have the Vehicle line moved to the bottom (as in the Desperation Morale version of the IFT). Lastly, there are errors in some of the charts. This was virtually inevitable, given that new versions of all of the previously scanned charts and tables were created–even eagle-eyed proofreading would miss one or two items. However, no list of errata has been released yet (nor sticky errata created), which is a bit of a problem. 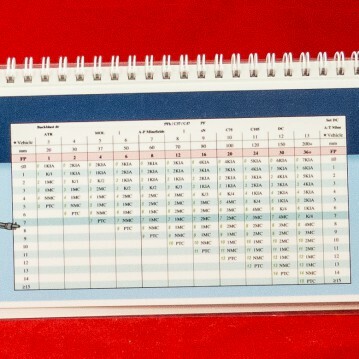 Despite these imperfections, the 2nd Edition Rat Pocket Charts are an excellent product and well worth a purchase. They could probably use a 3rd Edition to fix the errata and make the charts error-free, but the 2nd Edition Charts are usable (and more ethical than the first edition charts). If there ever is a third edition, hopefully LFT will change the color of the front/back covers to something other than blue, in order to make different editions more easily distinguishable from each other–the 1st and 2nd editions are too similar looking and an owner of both editions could easily grab the wrong one if not careful. The 2nd Edition charts are a Desperation Morale recommended product.